When deciding on a well water system, there are many components to consider for purchase. In addition, the cost to run the components, including the water pump, must be taken into consideration. Water pumps consume energy like any typical appliance. 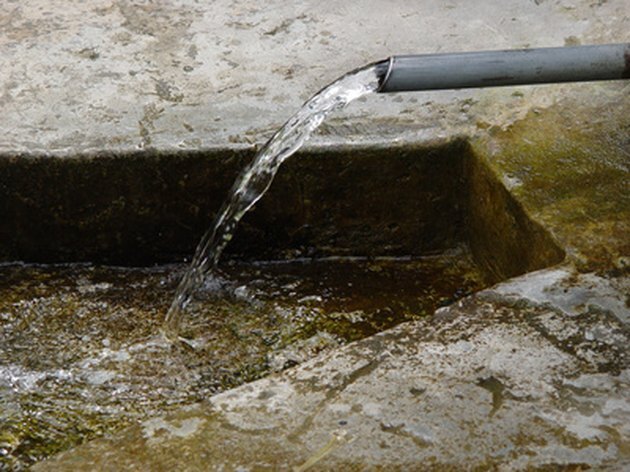 A water pump mechanically moves water from the bottom of a well, up to a storage tank within the building it supplies. Though the water pump does not run continuously, it does consume power when it activates and deactivates. There is a calculation to find the power consumption of a water pump. A typical water pump's wattage can vary between 250 watts to 1,100 watts. Take the wattage of the specific water pump and multiply it times how many hours a day it runs. Then, multiply it by how many days a year it runs, and divide by 1000. This will give the amount of kilowatt-hours the pump is using. If the kilowatt-hour is then multiplied by the local rate of electricity, such as 8.5 cents per kilowatt-hour, then the dollar amount per year can be calculated. Keep in mind that higher horsepower values, from 0.5 hp to 5 hp, consume more power with their varying wattages. What Are the Three Main Sources of California's Fresh Water Supply? What Causes a Well to Run Dry? What Is a GPH Fountain Pump?